In 2008 Wyland and the Wyland Foundation set out to paint 100 Wyland Whaling Walls. These life-size wall murals are absolutely gorgeous to see in-person. My husband and I have been trying to visit as many that we can and document our visit by taking photos and blogging about it here on our blog. 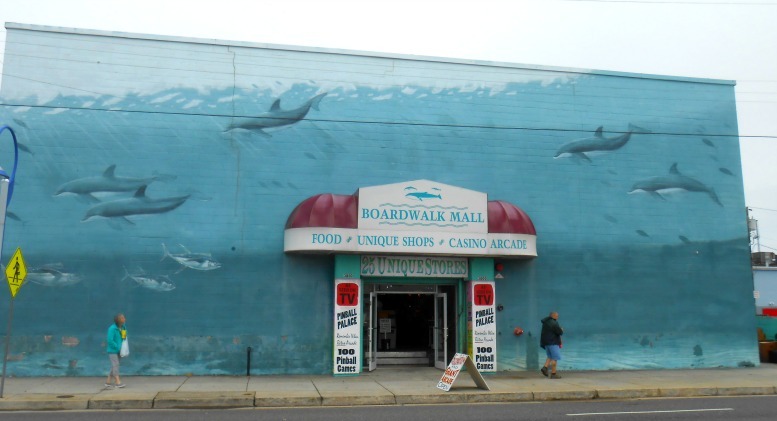 The Wyland Whaling Wall in Wildwood is officially titled the "Humpbacks off the Jersey Coast" and is located at 3800 Boardwalk Mall in Wildwood New Jersey. It's on the side of the building of that little indoor mall, so it's really easy to find. When viewing it, check out the long side of the building as shown in the first three photos, but make sure you walk around to the front of the boardwalk mall (the front towards the street) to see the entire mural which wraps around. This particular Whale Wall was dedicated on July 26th, 1993 and is an iconic symbol when visiting the south Jersey Shore. It measures a whopping 220 Feet Long x 30 Feet High. I would definitely say it's life-size or close to it! When photographing it...it's really hard because it's a large wall and right across the alleyway is a large parking lot that is always full of cars. If you get up close to take a close-up shot...you can't get the entire view. With that said, all three of my photos in this post are clickable...meaning that if you click on them, they will open in a new window and will automatically be enlarged so you can see the details on them. The Wyland Whaling Wall in Wildwood features two very large humpback whales swimming with their offspring. Each mom has a baby swimming with her if you look closely at my photos. There is also a sea turtle swimming near the bottom edge too! The next time you are down visiting Stone Harbor, Wildwood or Cape May...make sure you head on over to the Wildwood boardwalk and look for this beautiful Wyland Whaling Wall. It's gorgeous!!! Note: You can click on each photo in this blog post which will open it in a new window. It will automatically enlarge so that you can see the details up close and personal. These are beautiful murals no I enjoyed clicking on each to see all the details of the whale swimming with their offspring.